It Works! 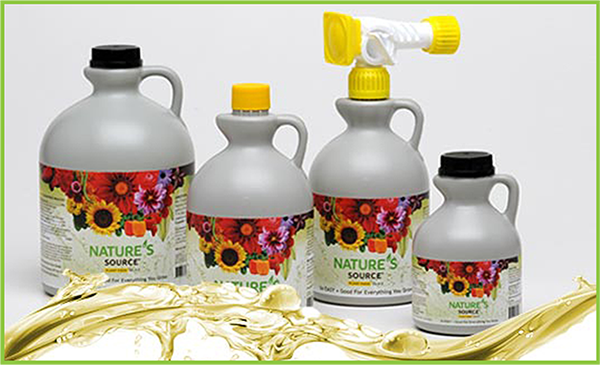 Nature’s Source plant food has been the power behind the flower in professional growing facilities since 1994. The secret is in the seed extract that is the foundation of this sustainable low salt formulation. Rooted in St. Louis as a second generation greenhouse operation, we are proud of our heritage and a big part of our success is attributed to Nature’s Source plant food. As a commercial wholesale grower, timely applications of plant food are the key to the health of our plants. Professionally, we have used Nature’s Source plant food for 15 years and personally, we trust Nature’s Source plant food on all our plants, indoors and out: trees, shrubs, flowers, foliage, turf, vegetables, herbs….everything! Nature’s Source plant food not only feeds your plants it also feeds your soil! Since Nature’s Source contains naturally based oilseed extract it provides a food source for beneficial soil microbes promoting healthier growing conditions. It is effective and also safe to use around children and pets. Watch these videos to see what Dr. Allan Armitage, Professor Emeritus, Horticulture has to say about this amazing product! For more information about Nature’s Source, you can visit their website by clicking here.